GaymerX convention a hit for furries, gamers, gay and "geek culture"
Acceptance between cultures makes them thrive. 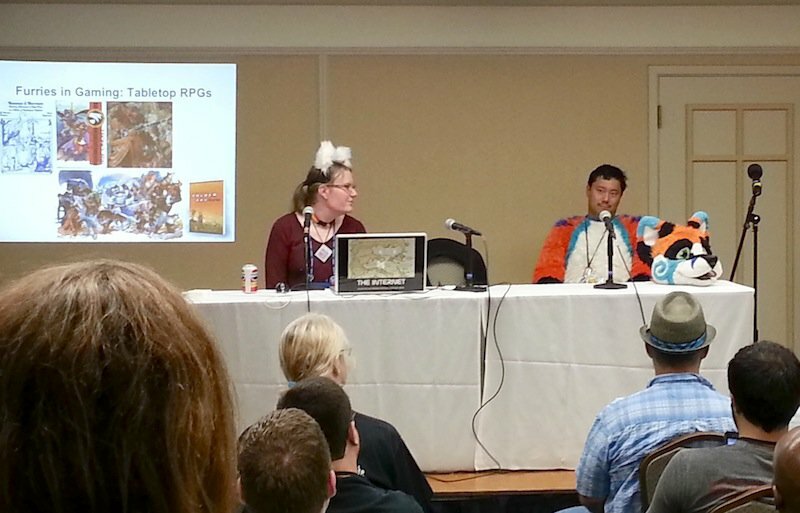 At the GaymerX convention on August 3-4, acceptance was a basic idea for a popular panel- "Natural Allies: Gaymers and Furries". GaymerX, the first gaming convention focused on LGBT themes, won media buzz and crowds through active inclusion. 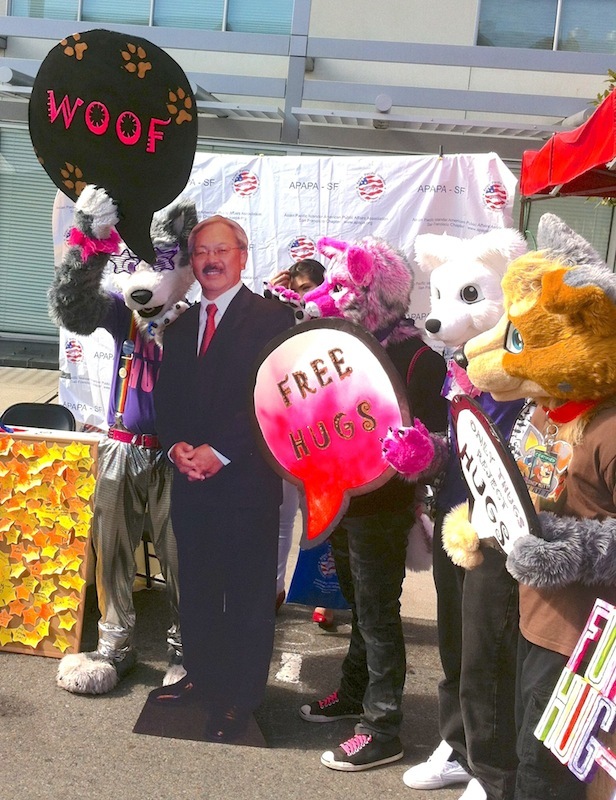 Inviting allies in "geek culture" to an "arms-open party for anyone who wants to join", it drew over 2,000 to San Francisco's Japantown (a heavy turnout for a first con, compared to established furry conventions.) Founder Matt Conn called it "just the start". Furs were with GaymerX when it was only a dream, and when that dream became reality. At Further Confusion 2012, I was fursuiting on the street for the first time, when I bumped into Agius. He was an acquaintance through San Francisco's monthly furry nightclub, Frolic, which was how I was introduced to Furry fandom (besides a brief visit to Anthrocon '99). 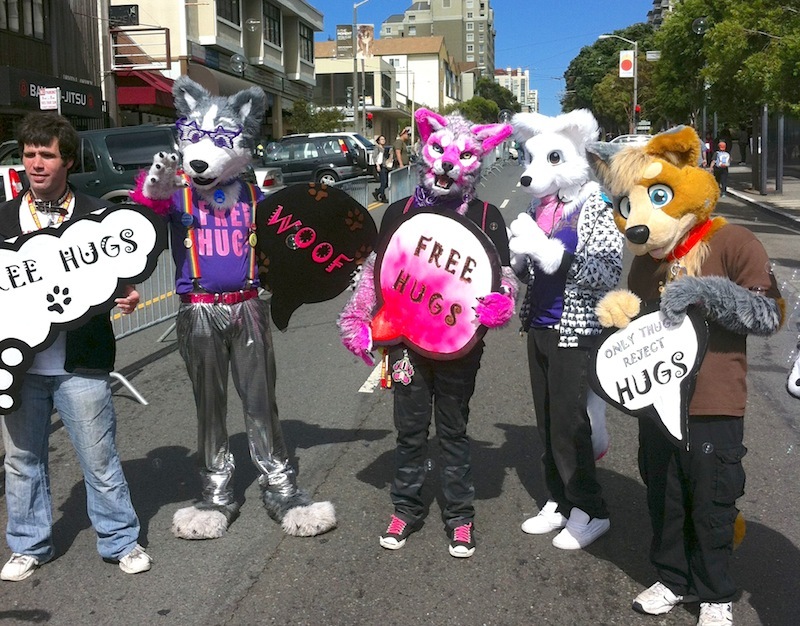 Word had gotten around San Francisco through the world's most dense population of furries. It made me curious, but as a non-gay, I wasn't sure if I wanted to visit a gay bar. After a dance with a fursuited otter, I would never miss going. It brought me to Further Confusion. Agius (now tech director of GaymerX) introduced me to his friend, Matt Conn. Matt told me about his idea to start the convention. Months later, Matt funded a website and a Kickstarter campaign to make GaymerX happen. Further Confusion ran a table at to the convention, bringing fursuiters who drummed up interest for the "Gaymers and Furries" panel. There, a standing-room only audience of non-furries lined up out the door to get their first introduction. Panelists Groggy, Dax, and Vulpinfox answered a lot of questions about topics such as fursuiting. They also discussed one of the reasons why GaymerX exists: negativity. Frolic is the nicest party I've ever been to in my life. It's so chill, there's very little drama. 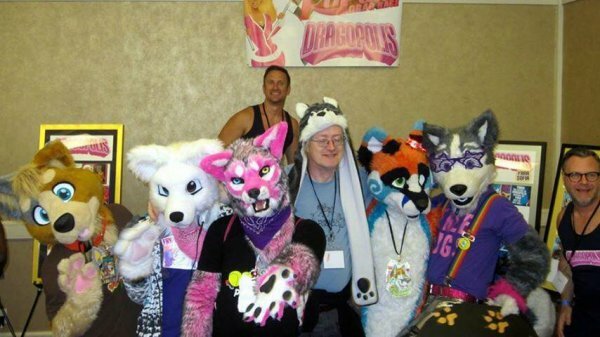 How can we be more like furries, and bring that acceptance to gaming? The team of So Much Drama Studios was excited to tweet about a visit by furries, while promoting their "first-ever mobile game serving drag queen realness"- RuPaul's Drag Race: Dragopolis. The average gaymers looked like a casual crowd on any city street, except they were mingling with a drag performer playing Storm from X-Men, a fursuited snow leopard, and others displaying lovingly assembled cosplay of game characters. What do you call a group of furries? Is it a herd or a flock? We were a Pride. Our plan was to upstage a protest threat by the anti-gay Westboro Baptist Church. (It was probably the first time furries would encounter them, but the threat has happened before.) It was a non-confrontational plan to ignore them and their notorious "God Hates Fags" signs, while being positive and demonstrating a "hug-in." Despite their threats, WBC chickened out and didn't appear. However, we were demonstrating something positive that needed no adversary, so it got public appreciation on its own. We brought pro-hugs signs down the street to Japantown's 40th annual Nihonmachi Street Fair. 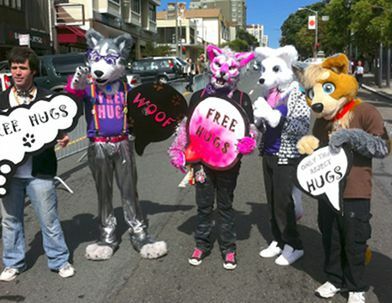 "Free Hugs" collars were given out. Todd gave essential support by building signs and hauling a wagon with music and bubble machines. The street fair responded by asking us to lead their Fun and Furry Pooch Pageant and Doggy Parade (a benefit for San Francisco Animal Care & Control). I'll ask the FC team and Matt Conn if they can respond in comments. "Connections and Camaraderie at GaymerX" and "Geeky, Adorable Gay Marriage Proposal at GaymerX Convention". I think I am beginning to notice a pattern. Go on. Let's hear how you can twist this to say it's totally not furry news. I've noticed a pattern, too. We had a blast, and I hope we can do it again next year! Whoah, two con reports in a row!